Every year a pair of Peregrine falcons make a nest and lay some eggs at the top of the Market Tower building in downtown Indianapolis. 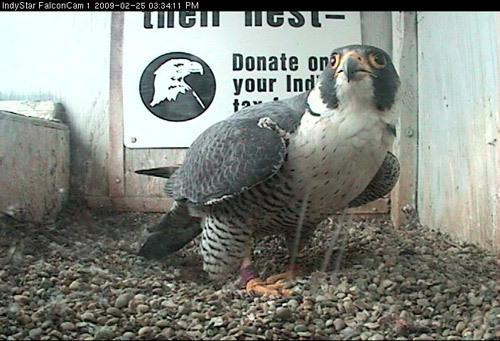 The Indy Star has a pair of webcams in the nest box so you can watch the lil’ birdies in 30-second updates. You can also take bets on when the first eggs will be laid and when the fuzzy lil’ birdie babies will be born (probably in a week or two if you look at previous years). All the updates are reported on the falcon blog. I’ve had the webcam up on my computer at work, watching as the falcons come and go, making circles digging out their nest, and generally wishing I was a bird who could just fly around as I please instead of a woman sitting behind a computer all day with a constant headache. Do birds even get headaches? Later: Beg the government for money on my behalf, will you? I love the falcon cam! That’s so cool that your job is somehow mysteriously connected. Thanks for posting this. It will be great fun to watch the falcons. I love birds! How cool! My kids school is the “Falcons” so they should get a kick out of it! neat! i love animal webcams. just shared the link with all my friends on FB hopefully you’ll get some more hits and peeps who will check it as often as me! Very cool!! I can’t wait to see the fuzzy little babies!! Are urban high rises a new habitat for these birds? We have a set of our own in San Jose. The city has a link to the bird webcam on its website. I know this has nothing to do with your current blog but I just finished your book and I wanted to let you know it is great! I really enjoyed it and I have recommended it to all my friends! 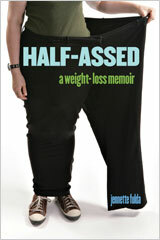 Me and some of my girlfriends are on a weight loss journey together and they have formed a line waiting for your book! I loved it because you took the humorous approach: changing your life should be fun! We are really trying to make solid lifestyle changes and become healthier…the weight loss is just a plus! Anyhow, I just wanted to compliment your writing because it was fabulous! I look forward to updates when the chicks hatch! I love animal web cams. We have a baby panda one here at our zoo and it’s addicting! 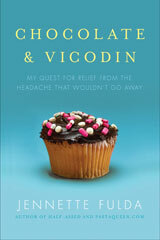 I just finished your book last night and I really enjoyed it. You’re a great writer and an inspiration!